WASHINGTON, March 20 (APP): The Muslim countries should forge unity to effectively deal with multiple challenges afflicting the Middle East, a known Pakistani scholar working to promote interfaith harmony said. 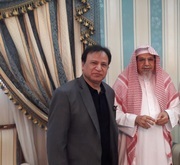 Dr. Zulfiqar Kazmi, who heads The Commongrounds organization, and recently met with Imam-eKaaba Sheikh Saleh Aal Talib and Raees ul Moazzneen Sheikh Ali Mulla in Saudi Arabia, said Islam’s message of peaceful coexistence and mutual respect should guide the Islamic world in these troubled times. “We must use dialogue to overcome differences and promote understanding within our ranks, and at the same time, hold interfaith discourse with followers of Abrahamic faiths and other religions for collective well being of all,” he said in an interview. The Washington-based scholar particularly referred to the importance of a comprehensive plan to deal with militancy and conflicts in the Middle East, and strive for resolution to political disputes including the Palestinian question and the Kashmir dispute that have been cause of much suffering. Kazmi, who last year also had an audience meeting with Pope Francis, and holds regular discussions with Islamic leaders at seminars, said the Imam-e-Kaaba particularly highlighted the need for engaging the youth in constructively for a better future. OUR MISSION: TO SPREAD THE POWER OF FAITH WE MAY ONLY INSPIRE THROUGH COMMONGROUNDS. LET'S RESPECT, ACCEPT & PRPOTECT THE TRUE SPIRIT OF ALL RELIGIONS SPECIFICALLY ABRAHAMIC FAITH FOLLOWING ONE FAMILY UNDER GOD. Holy City Mekha, Saudi Arabia (January 19th, 2018) It was a privilege and honor to meet with His Eminence Imam of Kaba Sheikh Saleh bin Humayd at his residence today in Mekha. Imam Ḥumayd previously served to the Kingdom as President of Saudi Majlis al Shura (Consultative Assembly of Saudi Arabia).